I cringed with shame, listening to your speech made at the 72nd anniversary of the United National Party. Later I thought to myself, “Why should I be ashamed, I’m not your wife or child!” But, why did I cringe? Because you are the only viscerally conscious liberal democrat in current politics in Sri Lanka. Regardless of your good and bad, rights and wrongs, I believed that you are the only current politician who was futuristic. Because I stood up for you when Sirisena et al attempted their damndest to oust you with a No Confidence Motion in an undemocratic fashion. Because I have challenged with all my heart the comic and destructive media persona painted by your opponents. I have believed that you have some ‘political humanity” and unparalleled institutional knowledge in politics that a few possess. Because I personally know that, much beyond the perceived political animal, you are a fine, elegant, sophisticated, patient man with inherent civility. Ranil, if I have ever stood up for you, it’s not because I’m a Ranil Slave in the brand of those wannabe superman or spider men hanging from electric poles in the mist of Janabalaya to Colombo. It’s because I believed that there remains in your heart a soft corner for democracy and country. I’m ashamed, listening to your UNP anniversary speech, Ranil. Is my Prime Minister really like this? I didn’t realize you were this hard up for thinkers and speech writers. Found below is the official text of the anniversary speech released by your office. The initial passages are selected from your speech. The large letters in dark fonts are the speech you should have delivered if you had a human being still living in your heart. So what if this comes too late? Although you do not know me, I know you! So are you ready, Ranil? This can be a fun game. Even a small boy can play it. “Today we celebrate the 72nd anniversary of the UNP. The UNP started from the Farm Court Mansion and today it’s housed at the Sirikotha in Sri Jayewardenepura Kotte. The UNP is the party of the Nation. It’s the party that can bring together all religions. The largest single party in the country. It’s the party that was instrumental in gaining dominion status to our country. It’s the party that brought freedom to our country. Therefore, from a context of freedom, the UNP really is the real Sri Lanka Freedom Party! The anniversary celebration of the UNP is really a celebration of the freedom, potential, power and the vision of our people without any divisions along race, religion or caste. The UNP is the only party in this country where a man of any race can climb politically. It’s the only party from which a man of any caste has the freedom to be President. It’s the party where a man can rise to Premiership regardless of his caste or class. From a context of belief in social justice and equality, the UNP is far ahead of so called socialist parties. We in the UNP are more just and more socialist. Therefore we are celebrating the 72nd anniversary of a political party that believes in humanity and equal ground for all our citizens. Ranil, as you are the Prime Minister, try not to use words like ‘pacha’. Tch. Tch. “Yesterday, I received a telephone call enquiring if we are going ahead with our anniversary celebrations in spite of the Janabalaya to Colombo protest march. I was informed that Pohottuwa was going to encircle Colombo and topple the government, that citizens and students were terrorized”. However, as the leader of the largest political party in the country, I’m not bothered about the so-called power of the Pohottuwa, nor the power of biased media. I respect the power of the people. In spite of the best attempts by certain media to propagate fake news, the people are ahead of media. Through the internet and social media people communicate their ideas, real beliefs and hopes. We now live in a society where traditional speeches and deceit no longer apply. People are networked though the information technology, internet and Facebook and other forms of Social Media. They exchange ideas instantaneously and they have found a large space for their ideas. In that modern open society no one can fool the citizens whether the citizen is a farmer, doctor, clerk, student or manual worker. The citizen understand their power. The society where people participated in rallies for alcohol, rice packet or money will soon end. As the UNP we must think of ushering in a society where people rally for the truth, policies and development. Potottuwa is exploiting the sentimentality and poverty of the people to fool them Some media organizations try to inflate the importance of Pohottuwa. So, it will be short lived. The more we try to bring together people in the society the more these media organizations will poison the minds of people with mistrust and phobias. All over the world, traditional politics is challenged by populism. Populism offers anger without solution. This demands a new brand of politics from us. Whenever a leader who believes in democracy and equality emerge, these forces will destroy that politician’s image with ridicule and fake news. If one succumbs to this wave it will denote the end. The wave of truth should overcurrent the wave of fake news. The new generation of leaders should be equipped to handle this phenomenon. We must constantly engage with the people and the media. We must be accountable and responsible to them. Whenever we try to bring unity, some politicians, media organizations and businessmen will try to introduce division. But remember, the UNP is the party of unity. The UNP tries to build the citizen. Our party should enjoy our victory in a democratic manner. We mustn’t break the law to enslave the membership. Do not use the ‘takarang sheet’, Samurdhi allowance or a job chit to enslave the members. It’s not good for human dignity. If we respect our members they should be able to stand straight in front of us and criticize us. They should stand on equal ground with us. The UNP does not need slaves. We do not work towards hero worshipping icons or coronating heirs to thrones. As late president JR Jayewardene said, we “do not have a dynasty to protect; nor an inheritance to fatten; nor princess and princesses to coronate: our dynasty, inheritance and heirs are the people of this country” While speaking of dynastic politics, I would also like to speak about the future leadership of the UNP. “We must build the next generation. We must hand over the country to them. I will plan till 2025. They must plan till 2030. We must make a long term journey” (extracted). Ranil, Ranil, Ranil…. Be a little philosophical. 2019 will come before 2025. How if you said this bit? “We must build the next generation. We don’t need slaves. We in the UNP think about the modern and equal world of tomorrow. The future of the UNP should also be modern and equal. The leadership of the UNP is not a crown to be placed on anyone’s head. I will only coronate citizens of this country. I believe in democracy within the country and party. The second line leaders of the party should have the strength of character to declare their bid for party leadership in so many words and carry their intentions through. One cannot be the leader of the party through media games, defaming and weakening the party and causing division in the membership. The next leader of the UNP should be the deserving one. It should be given, not for an heir, nor to a trick master. The next leader of the UNP should be an educated, intelligent progressive leader who can win the love of the people. That leader should be patient, believe in co-existence. That leader should denounce racism, be qualified and able to interact with world leaders. That leader should understand the pain and the sorrows of our people. Above all this the next leader of the UNP should have the personality and the moral courage to declare that he is coming forward for that role. My heart and the leadership of the UNP is open for that person. Ranil, I wonder if you know that there are 52% Homo sapiens in our country called women. I think you are married to one of them. Therefore, how nice it would have been if you said this bit too? 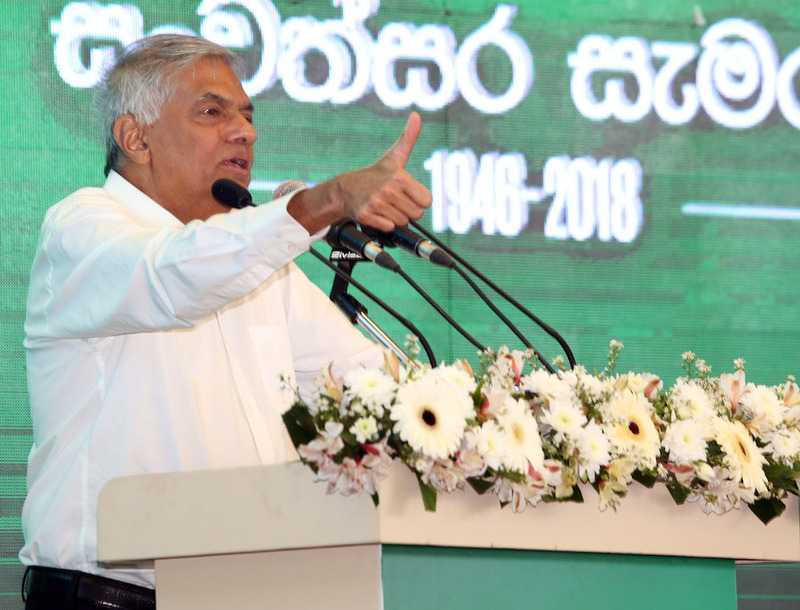 “Not only the future leadership of UNP is not the inheritance of one family or one heir, I must also reiterate that it’s also not the inheritance of men. Remember that it’s the UNP that brought the historic electoral reform to bring in 25% minimum female representation on local government bodies. Our party is democratic. We are liberal in our views. We have no divisions or discriminations. Our future party leader can be a woman leader. In many developed countries the heads of state are women and young leaders. We must understand that reality. As the UNP we must think of our party, country, citizens, women and children with a free mindset. Today in the morning the supreme court of India made a verdict abolishing an archaic colonial law criminalizing citizens based on their gender identity. Those countries that are progressing look at their citizens in a humane way. They strive to include all segments of society to usher in a new world. If we are to progress we must say no to all forms of discrimination; look at society with kind eyes; distance ourselves from self-serving aspirations. There is no one who is not needed to build this party”. So Ranil we are done for today. We shall play this game again another day. Till then, remember, you are a national leader. Your words don’t swirl in the wind and disappear in to thin air. The whole nation is watching you. This is a new game – putting words into the mouth of a die-hard politician who inherited a party formed by a so-called ‘father of the nation’ who promised equality to all at ‘independence’ and, soon disenfranchised the estate workers who were the backbone of the economy. How about a few words on the CB Scam? RE: Ranil, Shall We Play A Game? It is incoherence of the incoherence. There is a serious turn of events prompting the change of political equation. The government is unable to stay together cohesively. There is no coherence within the government. There is conflict within the government. There is a serious competition between President Maithripala Sirisena and Prime Minister Ranil Wickremesinghe representing two currents of thought. It has almost reached the point of breaking up. I expect the current political situation to develop into a split within the governing coalition. Moda amarasiri: VAsu has to talk for Rajapakses as Mahinda Rajapakse gave a PRESIDENT FUNDs for his son to attend what ever he is doinfg in the USA (supposed to be university, I hear he is coming back to become a Parliamantarian as jobs are scarce there) and also a advisor job to Vasu’s wife because they needed little petti cash in case the they need some extra funds. Otherwise, even among Rajapakses there are major disagreements. MaRa has given funds to a lot people, and the UNP has given funds to quite a few people, all people’s money stolen. It is incoherence of the incoherence! 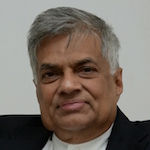 If an unavoidable presidential election is to be held , the majority in the lower rung of the UNP has decided that Ranil Wickremesinghe shall not be fielded as the presidential candidate, according to unofficial reports. At all events , what is expected of the victorious presidential candidate by the pro good governance hearts are : he must clean up the remaining dirt and filth of the executive presidency ; does not promote his family’s success; has proved his non partisan traits but in whom the UNP can repose implicit faith ; after coming to power he does not again cling on to the party; knows what is non partisan presidency ; acts constitutionally ; of good character ; can be trusted by the Sinhala Buddhists, minorities, Leftists , business community, and civil organizations without issues; has an untarnished international image ; respectable; virtuous ; and possessed of a war hero character. How about a few words on 1983 riots and war crimes committed between 1987 and 1990 in the south and from 1977 to 1993 and supplying from A to Z to LTTE? Don’t you want to mention the 1978 constitution which is best suited for elected dictatorship? Whoever whatever is said and done, there is no someone to close RW. That will protect him in the days to come. Bank bond scam is an issue that he could nnt forsee, but investigations should be held from 2008 to show the face of previous Govt how they handled them in their days. There had been no growth in Economy but to show the world it had was a real abuse. No income into the country flew. Nor were there any increase in state, so how could former goons explain all these ? To my knowledge, RANIL is somewhat a respectable figure, the only figure who could be believed that he would do something for the betterment of the entirety of the population. What puzzles our minds is the way he behaved in allowing the ZIONIST PIG PROJECT of destroying the MUSLIMS by the Rajapakse led SINHALA ZIO-PIG Racist groups and individuals in the likes of “JHU-CHAMPIKA/ BBS-GNANASARA/ Wimal Weerawangsa/ Gammanpila/ Gota and his Henchos / Ajith Prasanna / Elle Gunawangsa / Dan Priyasad / Madhu Madhawa / MAHANAYAKES who voiced their support for Gnanasara saying that he works for the SAASANA/ and other like minded Sinhala Buddhist Politicians, academics, professionals, Buddhist Activists, Civil servants, Members in the Armed forces, Islamophobic-STF (State Terror Forces), Ratwatte gangsters etc…etc.???? Many must have easily identified the MOSSAD hand in this whole ISLAMOPHIBIC Agenda working in secret for the US/NATO future plan to destroy the ONLY NUCLEAR ARMED MUSLIM NATION – Pakistan and the emerging regional power IRAN. The NEXUS that created between MODI-RSS-SHIV SENA with Rajapakse+Govigama Ruling Elites-BODU BALA SENA-JHU joining in hands with the MYANMAR Junta-MA BA THA- 969 (actually its 666 the beast) all had ONE COMMON GOAL in their mind —its to destroy the Muslims and to show their preparedness for the regional readiness for the WAR ON TERROR (The secret war on Islam & the Muslims). For some reason the GOVIGAMA MAFIA Regime shelved it temporarily after their debacle-pogrom (state sponsored) of KANDY/Digana riots exposed the workings and the coordination prevailed betweenthe state apparatus and the BBS led mob Terrorists. does not your work above, indicate a hidden intention for you be selected as the speech writer to Ranil. Reading through all your inductive arguments, such as “you being standing by him through the “No Confidence Vote”, [by how , may I ask] , by writing a n article in the Colombo Telegraph, ( citation given in the original article). Really, and you think that publishing the above referred article was an act of standing by Ranil. I am sure that he would not have read your aforesaid article, let alone, consider you as an ardent supporter of Ranil. I know since I’ve worked with him, as a member of the ” UNP Think Tank”, where a selected group of professional met and deliberated for long hours to formulate winning strategies for the UNP, when the party was going through a streak of election defeats. So please come back to earth, and be a good journalist that you are without fantasizing. From reading your articles, I see that you a objective minded critical thinker, who uses sound logic, and strong premises to support your conclusions. Yey you do seem to get carried away @ times. Powerful words if only Sri Lanka could apply this in practice .. Erase all racism; discrimination and prejudice as Singpore did .. It has many ethnicities ..chiness; malay; Indian; Tamils and many more yet; they built their nations .. Please invest on education and econmic development of the country ..
Today in the morning the supreme court of India made a verdict abolishing an archaic colonial law criminalizing citizens based on their gender identity. Ranil is not ready to make Muslims, Sinhala, Hindu, Christian’s women’s right equal in the country. It was invented in JR’s time exporting women to Middle to do any job is profitable on the exchange side. Old Royal exploded with it. (They sent the women to Middle East brought men by SLCTB buses to Kolombata and fed with arrack. The new law “Women should not work in restaurants” with in Lankawe is SLFP’s New King’s invention. UNP’s biggest nightmare now is MMDA. Ranil is saying he is following the path of Don Stephen. Under Don’s guidance MMDA passed. Thalatha has determined keep in under lock and key until 2020,2015 & 2030 elections passes. What happens to it after that is something she doesn’t care. Grushan I am a shamed that you assess this cunning low life an elegant, fine , sophisticated man. This chap made himself leader of the UNP for 25 years and PM three times and what a disaster he has been. But you cannot fool everyone all the time. The Bond scam was the final act of a greedy, meaningless career that is all me, me and me. The UNP has shown itself spiritually and intellectually hollow.Maybe it will be buried with Ranil’s career one day. GRUSHA: IT IS your culture which made the both Gay bashing Gay rights political issues. INdia had every thing you do you worship as norms but they di dnot make it politcal. Do you know temples crushed makes balls to make Gays. But, the law did not intervene. I think now LGBTQ rights are important because it is important to desteoy the buddhist culture of Asia. On the other hand, MODI employs his BUDDHIST DIPLOMACY and China has a new WORLD Buddhist Congress to counteract you. On th other hand, people like you also write books for the world market about extremist monks in Asia. Ao, BBS bhikku Ven ghanasara may be one to be made an idol for your needs. We join Grusha’s plea Ranil. Some of us take you literally. When you said that you have made the fallow fields you inherited into highly productive outfits, we ran to harvest. We found only empty promises. We cannot live on it but the promises live on us. Sira has to be taught a lesson no matter what. GRusha Andrews: when you write character certifiactes to a man like Ranil, That tALKS A LOT ABOUT YOU. yOUR NAME SAYS you are. So, nothing much to say. Can any living Politician in Lankawe match, this let alone bettering it ? Dr Ranil’s Loyal Deputy and the UNP Sinhala Buddhist Faction Leader has promised Dr Ranil, that he will bring 100.000 dalits to Kolombotota soon, to show Pohottuwa who their Bosses are . Can’t understand why Keselwatta Kid wants go into all that trouble when Dr Ranil’s Senior UNP Stalwart and the Minister for Christianity told Derana ,that Rajapksas brought only 25 thou Drunks to Kolombothurai.. The latest Strategy of the UNP Lokkas now is to piss off the President in 2020 with the JVP 20A and postpone the General Election till 2025 until Dr Ranil becomes 75…. What are you talking about. Why would he want a playmate at this late stage when he he has a lot of play mates MR, GOTHA, and the rest. He has been playing this game from the day MR was ousted. Despite his promise to right the wrong he has been harbouring Criminals , Thugs and Thieves. After all he is the son in law of JR. You are better off playing with a Bunny there are plenty. ALL THESE CORRUPT / CROOKED / PARASITIC POLITICIANS WHO KEEP LIVING HIGH LIVES WITH POOR MANS MONEY OUGHT TO ROT ALIVE AND IN HELL. She wants Ranil to say what she thinks. She is mad. You can say those in bold font when you are the Prime Minister and Leader of UNP. Let Ranil say what he wants to say. Stop offering us jokes Grusha.